Come and learn how to use Gutta resist to divide spaces, then fill those spaces will brilliant colors. This workshop is a bit different, for your Workshop Chair needs to order the silk dyeing supplies, which you get to keep, and which will make many more scarves, pillows, and silk pieces. 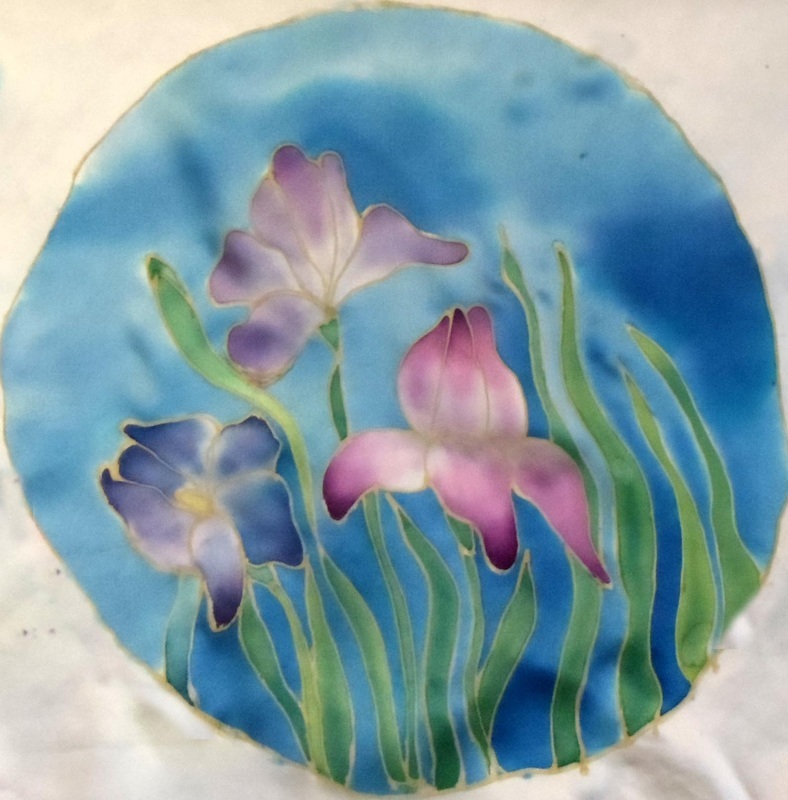 This is a beginners' class, where you learn to transfer patterns, mix colors, and make your dyes permanent. 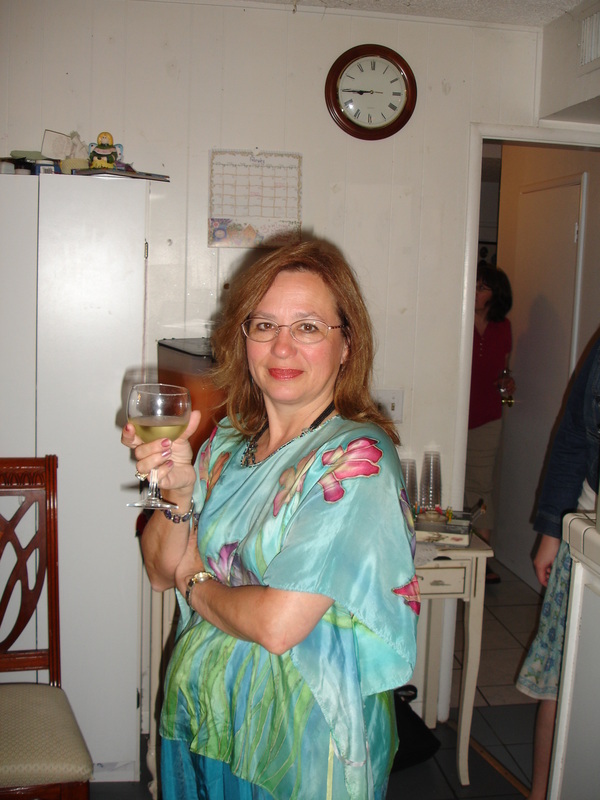 The blouse at the right is the second thing I ever silk painted, and I love it still. 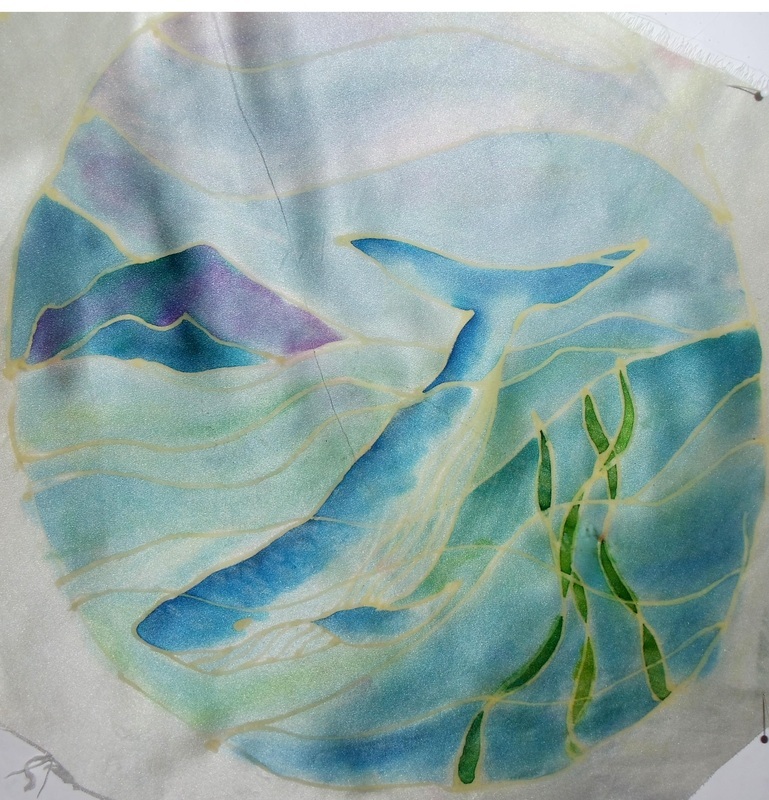 Come and learn a fast, easy, permanent way to paint on silk! Lovely colors are used in a watercolor fashion to create flowers, birds, and colorful blends suitable for blouses, scarves, pillows, and much more! The Jacquard silk painting kit comes with the basic colors, brush, gutta resist, and instruction book. It is enough to do several pieces, plus the workshop experimental pieces. You will also receive two pieces of silk to paint on during class. Materials fee of $10 for two weights of silk, patterns & handout to teacher; payment for Jacquard silk painting kit to your Program Chair at time of registration. 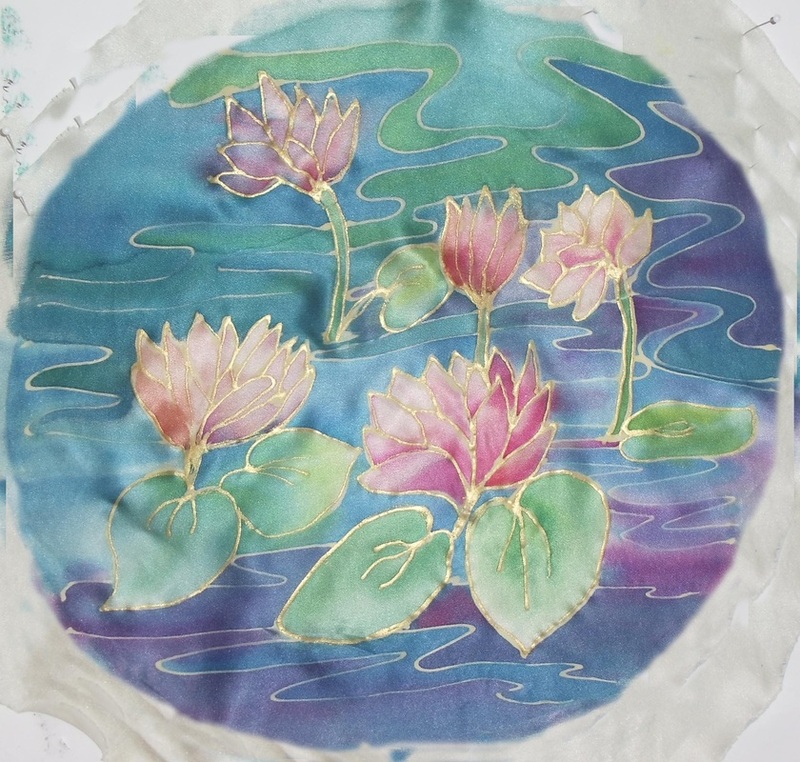 The kit is easily accessible at http://www.dharmatrading.com/dyes/jacquard-silk-colors-green-label.html?lnav=dyes.html We use the green label Jacquard silk dyes because they do not have to be steam set, just rinsed in a solution. two white ice cube trays, the kind with lots of little compartments is better than just a few big compartments. This is for mixing your colors in. Here are samples from the class. You get to choose from about 20 different patterns. 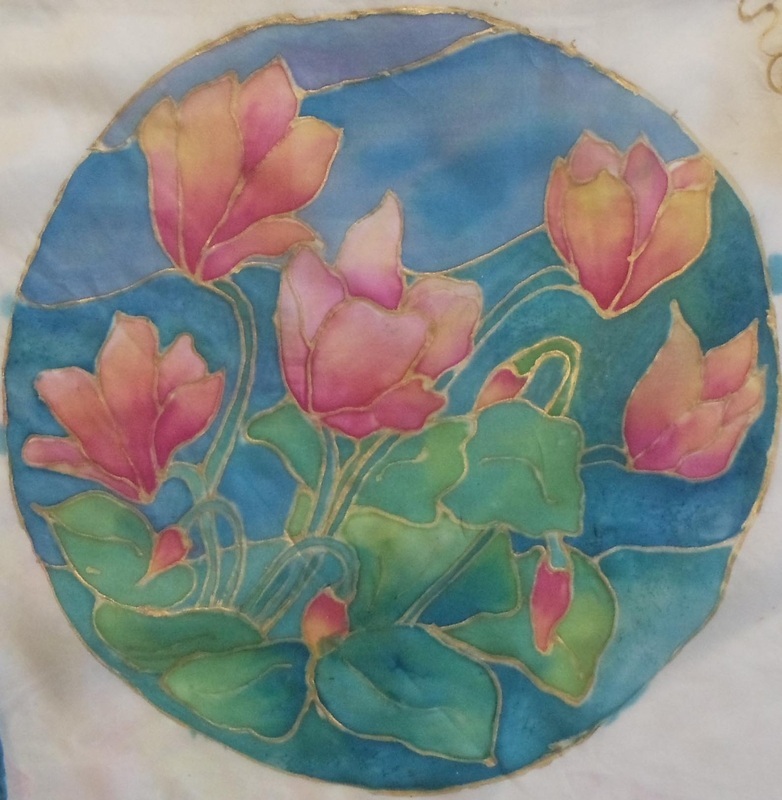 This is a blouse I painted on China silk, using the Iris pattern in the circle above. It was great fun, and I made it in a weekend. Similarly, you could use these patterns to make pillows, scarves, and other silk creations. You won't make this in class, but it's a sample of what you can do on a purchased blank scarf. 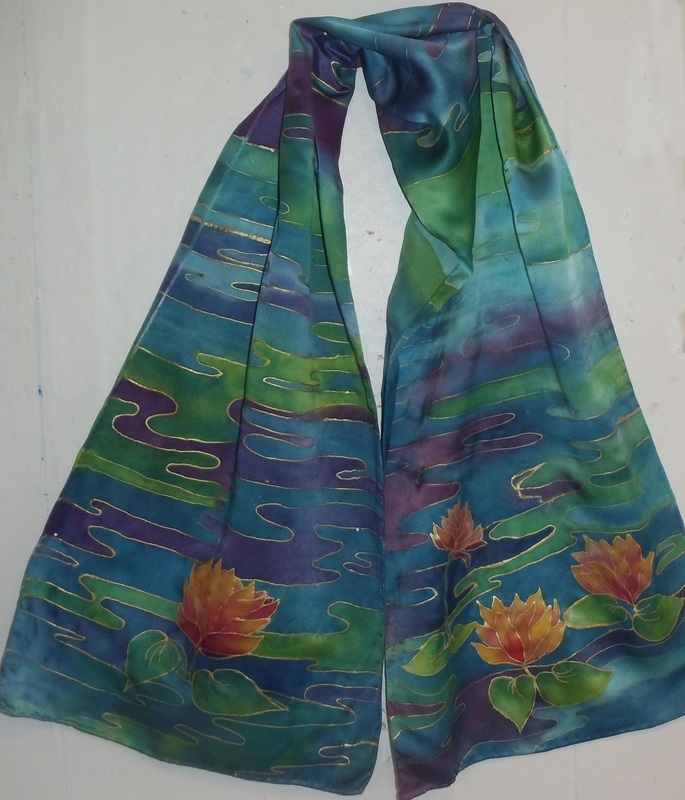 Here is a scarf with water lilies on it, I've also done a whale scarf, which was just a blast.